Red Lobster Shrimp Scampi is a terrific, buttery shrimp dish that you won’t want to miss You can make this recipe at home anytime. Red Lobster used to prepare this recipe from scratch; they now use a mix to make this tasty dish. Shrimp is cooked in a buttery sauce that is infused with garlic. You may want to serve this shrimp up with some pasta and a salad to make a complete meal. What I love about this dish is that you can put this one together so quickly and simply pop it into the oven. I sometimes buy a package of frozen shrimp and will set this in my refrigerator when I head out to work. When I come home from work in the evening it is thawed perfectly and then I can quickly assemble these for dinner. I love to serve up individual serving dishes of food when I have company over. The Red Lobster Shrimp Scampi is so easy to put together, it won’t be hard to prepare this famous Red Lobster Menu Item at home. A lot of people ask me can they substitute out the wine in the recipe, I would honestly say no. I would simply choose a different recipe instead. You can try to do this with chicken broth, but it won’t come out the same. If you are wondering what type of wine to use, I would suggest a dry one like a Chardonnay. I wouldn’t spend a lot of money on the wine. A Gallo wine would work well. If you don’t drink a lot of wine out the house, I might suggest you buy a bottle of Sherry and keep it around and use that when you need to use wine in a recipe. Do you like Red Lobster Recipes? Check out these other recipes. Make the Red Lobster Shrimp Scampi with this copycat recipe. In a small saucepan saute together the butter and the minced garlic until the garlic becomes fragrant. Add white wine to the saucepan and heat through.In a small bowl melt the butter in the microwave, add breadcrumbs and stir to combine. 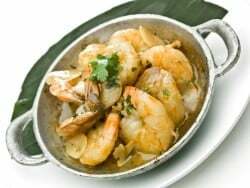 Place shrimp in a baking dish, pour marinade over, and top with bread crumbs. Bake at 350-degree oven for about 10 to 12 minutes. Be careful not to overcook the shrimp. The shrimp is done when it has turned pink. How do you do the bread crumbs for the recipe? Apparently some of these people CAN’T READ! Asking the same question over and over is the sign of an un-educated individual. All the alcohol evaporates out during the cooking process! AND yes it has a bread crumb coating in this recipe! Read! Read! Read! What kind or brand of white wine should I use or can I substitute something for the wine such as Welches White Sparkling Juice ? I would use something dry like a chardonay. I wouldn’t use the white sparkling juice, it could be sweet and I don’t think that would taste good. You may want to consider using chicken broth if you don’t want to use alcohol. I would not use this. The sparkling juice would be very sweet. I would substitute out chicken broth, but keep in mind it won’t taste the same. Alcohol is used in this preparation. I need to know what kind of white wine to use. can sombody give me a name of the white wine or do you use dry white wine? I JUST NEED THE RECIPE FOR THE SCAMPI BUTTER. That’s the recipe I’m looking for too! Try Kraft Zesty Italian Dressing. Works wonders!